Since the chain was created in the early nineties, the folks at Silver Diner Restaurants have worked with Helbing Lipp Recny Architects to develop the look and feel for their unique diner-based casual food restaurants. We researched what a diner should feel like and developed with the Owner the exterior appearance which included stainless steel, a central clock tower and retro features like the neon strips, the front door detailing, and even the art deco inspired lettering that is used throughout the building. 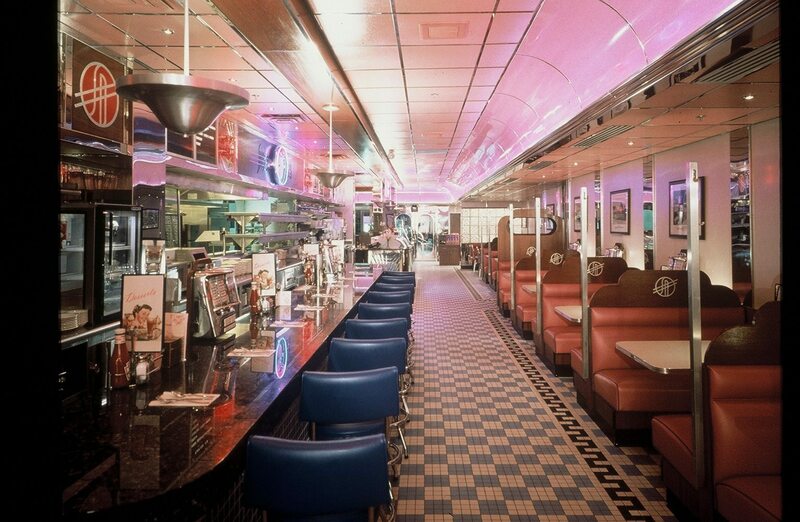 That ambience continues to the interior with mosaic ceramic tile flooring, 50’s style booths and countertops, complete with laminate “boomerang” patterns, and chrome edge strips. The sit-down counter is reminiscent of old diners that were originally made from railroad dining cars. As each new location was developed, we worked with the Owner to tweak the design using the experience of previously completed restaurants. In all, the building design reinforces the chain’s philosophy and appeal, and has been an important part of Silver Diner’s success.